Yale Gay and Lesbian Alumni/ae Association, Inc. - NYC: All-Ivy and Friends Post-Pride LGBTQ Mixer at Yale Club's Grand Ballroom! Post-Pride LGBTQ Mixer at The Yale Club of NYC. In the Grand Ballroom (20th floor of Yale Club). Great NYC views. Cost: $40, $20 for current students and 2015 grads (any school with student ID). 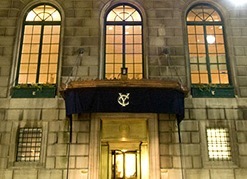 The Yale Club accepts cash only at the door. (Yale Club Members must call in advance & charge account). RSVP: Please RSVP to add your name to the guest list (for non- Yale Club members) and free RSVP. Payment is cash at the door, if you attend. RSVP link: http://goo.gl/EkBS9c RSVPs are still open. Please RSVP now to attend! Catch up with old friends and meet new ones at the beautiful Yale Club, now in the Grand Ballroom (20th floor of the Club), for the 10th annual mixer. The Grand Ballroom is the largest room in the Club, with beautiful NYC views, neoclassical architecture and an ornate, decorative ceiling. We invite alumni from Yale, Ivy League, Seven Sisters, Stanford, NYU, Duke, UVA, Georgetown, Williams, Amherst, UCLA & friends from any school for this spectacular evening! Many THANKS to our GALA Event Co-Hosts: FFR/Princeton BTGALA, HGSC (Harvard), Columbia Pride, CUGALA (Cornell), NYU LGBT Alumni Council, DGALA (Dartmouth), Stanford Pride and Brown TBGALA (list in formation) -- and to our organizing hosts for the evening: Yale GALA and the Yale Club of NYC.